Discussion in 'Land' started by matty1080, Aug 1, 2017.
do you prefer me using rendered images in my updates or if i use the screenshots of the models? Poll closed Aug 19, 2017. How about for the name of it, since everything is related to the name beam. What about BEAMCAR Sprint Truck series? Or something that is related to the real life counterpart. Since the real one is NASCAR Sprint Truck series or the Camping World truck series. I think it should be something like that. And hey you can't complain about it because I was actually on topic. this reminds me of my favorite NASCAR driver. It's been decided... Did you not see the picture? Why change something that is set? here is a little something i have been working on that will no doubt make this mod even more fun to mess around with. the body is wider than the standard truck....it features many extra aerodynamic aids including a front splitter, canhards, a rear diffuser and a larger plate spoiler. I didn't think i could possibly get more hyped but you just keep on raising the bar! so awesome. do you have any other D15 NASCAR pictures? Will this be a separate vehicle or will it be joined with the in-game D15? Separate. It uses a completely different frame and body. And before you ask, the release date is unknown. 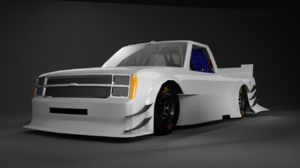 I know its based on a D15, but is it possible later on for someone to make the front and back look like the same generation Chevy NASCAR Truck (sorry don't know the name I'm not American) that Cleetus Mcfarland has? Since you are going to be doing panels, does that mean the panels will have to have seperate J-beams? Or like how the CRD works but maybe with stronger panels. MT Glorious! here i come!